Probashbangla24 Desk : A 47-year-old man and 54-year-old woman from Crawley are being questioned over multiple drone sightings that brought Gatwick Airport to a standstill. Flights were grounded for more than 36 hours when drones were first spotted close to the runway on Wednesday night. The airport has since reopened and flights were operating on schedule, but there were still long queues and some knock-on delays, a spokesman said. 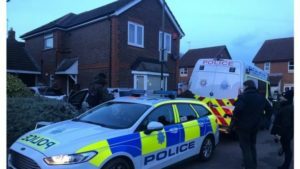 Police are searching a house in Crawley and the pair remain in custody. 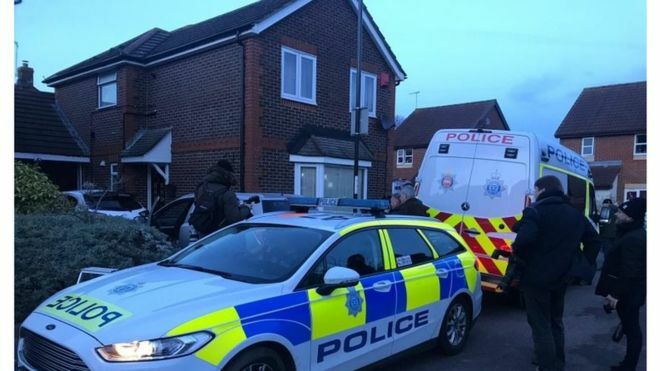 They were arrested on Friday evening and were being questioned on suspicion of disrupting civil aviation “to endanger or likely to endanger safety of operations or persons”, Sussex Police said. The force said it was deploying “a range of tactics” to prevent further incursions from drones following the arrests. Strategies were in place in case any further unmanned aircraft were seen inside the airport perimeter, it added. The airport said it aimed to run “a full schedule” of 757 flights on Saturday, carrying 124,484 passengers. A Gatwick spokesman said: “Many people will be due to fly today and there will be longer delays perhaps. The Shorrock family, from Oxford, arrived at the airport to fly to Innsbruck in the Austrian Alps for a skiing trip. Vivienne Shorrock said she was “relieved” to have avoided the disruption. “Some people have suffered real losses by not getting where they want to go to be with family,” she said. Her husband David joked the drama was a “nice distraction from Brexit”. Passengers have been warned to expect some delays and cancellations and advised to check with their airline before travelling to the airport. About 1,000 aircraft were either cancelled or diverted and about 140,000 passengers disrupted during three days of disruption. The airport was forced to shut its runway for spells on Wednesday and Friday and for all of Thursday. The drones were first spotted at about 21:00 GMT on Wednesday. Every time the airport sought to reopen the runway on Thursday, the drones returned. Authorities finally regained control over the airfield after the Army deployed unidentified military technology to guard the area, reassuring the airport that it was safe enough to fly from about 06:00 on Friday. The Israeli-developed Drone Dome system, which can detect drones using radar, is believed to have been used. It can jam communications between the drone and its operator, enabling authorities to take control of and land the device. But John Murray, professor of robotics and autonomous systems at the University of Hull, told the BBC the problem with this system was “you can find the drone but not the person operating it”. “You can take the drone out of the sky but you won’t capture the person and that’s what you want to do. “You can get a second-hand drone for between £200 and £300 so if you take it down, they can just go out and buy another one,” he said. The drones caused misery for travellers, with many sleeping on the airport floor as they searched for alternative routes to holidays and Christmas family gatherings. Thousands of passengers returning to the UK were either stranded abroad or diverted to other UK airports. A handful of flights due to arrive into Gatwick on Saturday were cancelled, according to the airport’s website, including an easyJet service from Milan-Linate and a TUI flight from Bridgetown, Barbados.